The week opened with a sharp rebound after the worst week for two years. US indices and NKY were up as trade war fears receded, and Chicago Fed National Activity beat at 1230. However, DAX and FTSE were down, reflecting their currency strength, EUR was up 0.8% and GBP up 0.7%. USD was weak everywhere except against JPY, with DXY falling 0.4%. Gold rose in line with the weaker dollar, however US 10-year bond yields were up. Oil prices slipped slightly after Friday’s sharp rise. The Monday rally was short-lived, and US equities fell on Tuesday, led by the tech fallout which itself was led by growing concern about the wholesale political use of data by Facebook, and the Uber self-driving car pedestrian fatality. Uber is not of course listed, but the autonomous component manufacturers, such as NVDA fell sharply. DJIA dropped by 1.4%, NDX by nearly 3%, and the FANG stocks had their worst day ever. 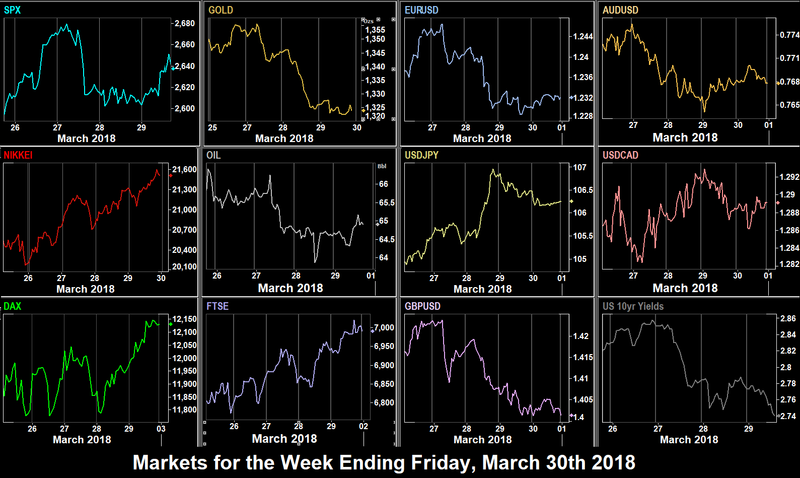 Some of the rotation was into bonds, not Gold, and so both yields (down to a seven week low at 2.77%) and the precious metal fell, whereas the equity risk-off sentiment was demonstrated by the fact that JPY rose against the dollar, whereas all other currencies fell. Oil fell in line with the dollar strength. A complete Turnaround Tuesday across all asset classes. To put the post-February crash volatility into perspective, Deutsche Bank reported that the average DJIA move for the last four days was 541 points, compared to 2017 where the average daily move was 68 points, and there were only three days last year where there was a 300 point move. The tech collapse continued on Wednesday although less aggressively, NDX was down 1.06%. However the four FANG stocks (that we cover) were down 2.46%. SPX was only down 0.3%, and DAX, FTSE and NKY, which have little in the way of tech components, rose, although this was largely helped by firm moves down in their respective currencies. USD rallied after the GDP Q4 beat at 1230 (2.9% vs 2.7%, comfortably above inflation), and DXY put on 0.8% on the day, with all currencies and Gold down. Yields were back up in line. Oil fell sharply by 1.5% after the EIA miss (which matched the API miss the day before), although it quickly recovered to finish the day roughly flat. We said last week that the last trading day of the week, month and quarter (and the fiscal year for some European companies) should see volatility, and so we did, with DJIA putting on 500 points from the 0400 low to the 2000 high, then giving up 200 points in the final hour. All indices were up, continuing the see-saw price/action, particularly into the close. Even troubled FB put on 4.42%. The dollar picture was very mixed, DXY fell a mere 12 cents (0.14%), but this was the effect of EUR and GBP fading slightly, whereas JPY and CAD [despite the GDP miss at 1230] appreciated, as did AUD (not in DXY). Oil was back up, touching $65 again, whereas Gold was flat on the day. There was also some bond buying into the quarter close at yields fell 4bp to close at a low for the week. Equity and bond markets, indeed the entire US and European exchanges were closed for the Good Friday holiday. NKY traded the cash session dipping 150 points but recovering to end flat. Forex markets were, as you would expect very subdued, with a very slight bias against USD. The most notable move was a 0.25% appreciation in CAD in 90 minutes from 0800, but this faded, and the loonie ended the day down. A similar pattern was seen in GBP, but EUR and JPY were up. If DXY had been quoted on Friday, it would have ended about 0.1% down. USD was up across the board this week, but not by much. The only pair that moved more than 1% was USDJPY, which would have been this week’s best forex trade. 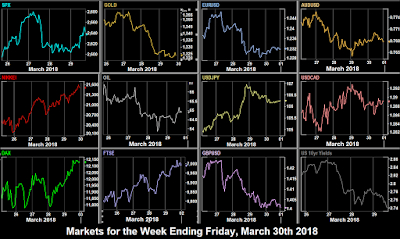 Despite all indices except DAX and NKY putting in inside weeks, movement was a bit more lively, with NKY the standout winner, helped by the falling yen. A new week, month, quarter, and for many Europeans, fiscal year. Also Australia and New Zealand have exited DST. Australia is now GMT+11, New Zealand GMT+12. Plenty of data this week, but in the end it will be a build-up to NFP. The Jewish festival of Pesach runs all week. Easter Monday is a public holiday in the UK, Australia and NZ, so expect lower volatility in forex in the morning session, as London provides the most volume in this asset class. FTSE and ASX will of course be closed, but Germany, Japan and the US are open. The important print of the day is the US ISM PMI, but it is more likely that new quarter positioning will influence price/action on the day. The RBA are expected to hold rates, and any upsets are unlikely. Otherwise we have various PMIs and Fed voting dove Neel Kashkari as the sole listed speaker of the day. Eurozone inflation is at 0900, although this rarely moves EUR as the constituent countries report in advance of the continent-wide figure. Of more interest is the ADP figure. The estimate is 205k, only 6k different from the NFP estimate. As always, a strong beat or miss may cause equity and USD volatility. Two Fed speakers today, both voters. Bullard (dove) is at 1445 and Mester (hawkish) at 1600. Bullard’s topic is the economy and monetary policy so his words are likely to be of more interest to traders. Taiwan is closed today until the following Monday. Watch oil for the EIA print, it has been reacting the last few weeks, and more importantly even when the API print has given a clear clue. The UK personal tax year ends. Expect some private investors to ‘bed-and-breakfast’ their holdings, ie to sell and re-buy the next day, to crystallise gains or losses, and use their annual £11,300 ($15,800) capital gains tax allowance, although this is not likely to seriously affect FTSE, and we don’t cover the UK junior markets. The ECB minutes will only move EUR if something unexpected appears. There is a small volatility opportunity in USDCAD at 1230, when both countries report trade figures simultaneously. Obviously one has to beat and the other to miss to get the desired effect. The first NFP day of Q2 has a ‘normal’ estimate of 198k, but as always watch for the AHE print. Last month we had a stellar jobs number but disappointing AHE and the market still soared. Of course logically the jobs affect equities whereas AHE affects USD (as it is the important determinant of rate rises). The Canadian print is simultaneous so we get another opportunity to trade USDCAD volatility, which is assured. The Canadian estimate is an extremely modest 4.1k. Also, Fed Chair Powell gives his first speech since the March rate hike in Chicago at 1530.